Proviso to sub -rule ( I) to rule 11-1 of Income Tax Rules. 1962 notified vide notificatio n (i.S.R. No. 117(E) dated 9.2 .20 17. states that :. 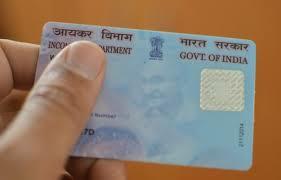 "an applicant may apply for a llotment of permanent account number through a common application form notified the Central Government in the Offical Gazette and the Principal Director General of Income Tax Systems) or Director General of income tax systems) shall specify the classes of persons. forms and format a long with procedure for safe and secure transmission of such forms and formats in relation to furnishing of Permanent Account Number(PAN). Electronically (SPICe)( Form No. INC·32) has been notified by the Ministry of Corporate Affairs vide notification G.S.R. No. 70(E) dated 25.1.20 17. Simplifie d Proforma for Incorpo rating Company Electronically (SPICe) (Form No. INC·32) of Ministry of Corporate Affairs(MCA) notified vide notification G.S.R. No. 70( E) dated 25.1.2 0 17.